Leggat McCall Properties, along with their joint venture partner Bentall Kennedy on behalf of its U.S. Core Fund, and development advisor Bozzuto Development Company, were joined by local elected officials for a groundbreaking ceremony for the mixed-use Harrison Albany Project in the South End. 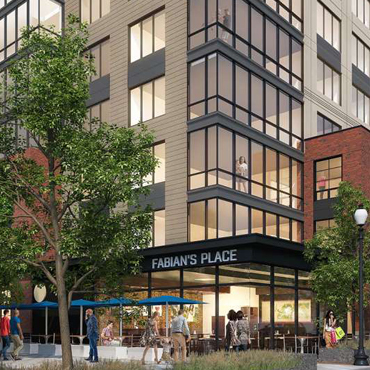 The Smith – named for the artisan history in the area South of Washington Street – will bring approximately 650 units, including an onsite affordable component, distributed over three buildings. In addition, there will be an estimated 76,800 sf of new and renovated office space, and roughly 19,700 sf of retail and cultural space on the ground floors of the buildings. The surface parking will be replaced with about 650 underground parking spaces. Of the 3.1-acre site, 36% will be open space, with publicly accessible open space representing over 20% of the Project Site. As part of the retail offerings, cultural space will be created for a variety of potential neighborhood uses. The project team views this as an opportunity to embrace the project’s location between the vibrant artist community, historic industrial uses, new small businesses, and the strong residential neighborhood of the South End. The site was purchased from the Boston Medical Center in 2014. The design by Boston-based firm CBT intends to complement the existing buildings in the neighborhood, and will be targeting the Silver level under the Leadership in Energy and Environmental Design (LEED).